With the implementation of Good & Service Tax (GST) in India import of Indian cars to Bhutan have become cheaper but third country imports have become more expensive. Under the GST rates, prices of all small and Mid-size cars in the same category such as Alto, i10, EON, i20 Elite, will drop by Nu 13,000 to 32,000. 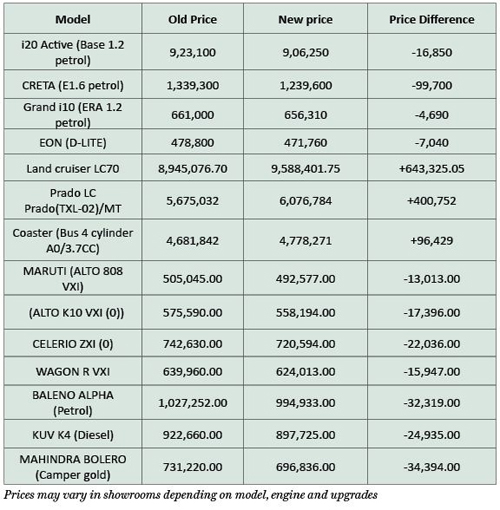 The biggest drop is in the medium sized Creta category with prices going down by around Nu 100,000. On the contrary prices of SUVs such as Land Cruiser, RAV4, and Coaster buses from third countries will go up due to the moving of tax from the point of entry to the point of sale. “As prices become more attractive and more people seek to own brands like ours, the market will surely expand due to GST rates,” one dealer said. Welcoming the new tax reforms (GST), Kuenzang Pelmo, a customer said that she is looking to buy a CRETA. “Under GST the prices have reduced,” she said. Earlier, when a car was imported it was taxed only at the point of entry or at the cost price of buying the car by the Bhutanese vehicle dealer. However, now a tax is imposed at the point of sale which would include not only the cost price of import but also the profit margin of the dealer along with all other associated costs like transport, insurance etc. However, with the GST reforms in India its exports have become zero rated which means that Bhutanese cars entering India don’t have to pay the excise duty in India which was annually refunded to Bhutan. So even with moving the tax from the point of entry to the point of sale making the tax amount higher while leaving the rate unchanged the cars prices have still dropped. We the customers are not happy with the Bhutan Governmant since now a tax is imposed at the point of sale which would include not only the cost price of import but also the profit margin of the dealer along with all other associated costs like transport, insurance etc ..
At the end we the public are the victims since government is imposing the tax on point of sale.